AURA is a registered not-for-profit society dedicated to the performance of fine choral music. Based in Vernon, BC, its 40 members come from throughout the Okanagan Valley and Shuswap area. It’s time to mark your calendar on November 28th and 29th for AURA’s fall concerts. The music is at turns thoughtful and contemplative, joyous and celebratory. 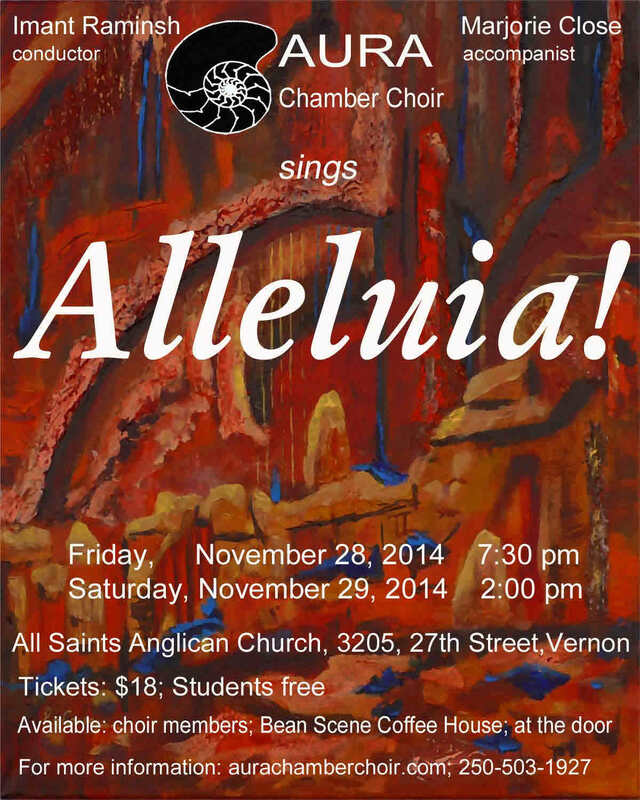 Four composers will offer an Alleluia, to frame Canadian, European and American carols. Rehearsals are going well and the choir is very excited to present such lovely music for your enjoyment. For many, this program marks the beginning of the preparation for the Christmas season. We will let you know as soon as tickets are available in the next few weeks. In the meantime, see the poster below for details. Please feel free to contact us at 250-503-1927 or 250-542-8118 if you would like more information. AURA is a registered not-for-profit society, dedicated to the performance of fine choral music. Based in Vernon, BC, its 40 members come from throughout the Okanagan Valley and Shuswap area. This entry was posted in Choral Music, Classical Music. Bookmark the permalink. AURA Charity Annual Reports Access the Canada Revenue Agency Charity records. Members resources To access Rehearsal aides, members lists, minutes of meetings and history of the choir, press here.